Professional Polish is the best and most versatile polish available. 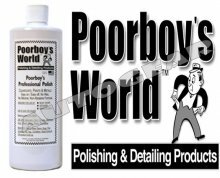 It is an awesome Paint/Clearcoat cleaner, Metal polish, and super on Glass, Plastic, Headlight Covers, and Plexiglass. Professional Polish is body shop safe and contains no Wax or Silicones. It's perfect as the final preparation before application of a wax or sealant. PERFECT FOR: ANTIQUES, CLASSICS, SHOW VEHICLES,TRUCKS, STREET RODS, MOTORCYCLES, MUSCLE CARS, RACE CARS AND BOATS!